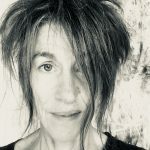 In this exclusive interview, Judith Modrak discusses her work focused on memory and inspired by brain cells, emotions and psychological states. 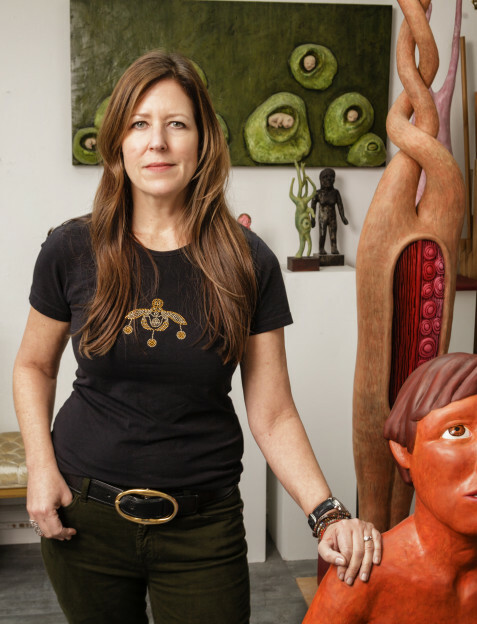 Judith Modrak: From an early age, I was emotionally hardwired and sensitive to my environment and those around me. Not surprisingly, I was attracted to art and other expressive mediums. I remember drawing elaborate pictures documenting my immediate world and the people in it. As I matured, I was equally curious about my natural surroundings and the creatures inhabiting it (lizards, birds, cats, dogs, caterpillars), though I felt an even stronger pull to visually depict the human condition, especially from a psychological perspective. Attending the Houston High School for Performing and Visual Arts (HSPVA) was a pivotal point in a rather tumultuous teenage life. HSPVA’s programs provided an outlet for a torrent of complicated emotions that found their voice in drawings, sculptures, and photography. HSPVA laid the foundation for majoring in studio art with degrees from the University of Rochester and the San Francisco Art Institute. Without question, my inquisitiveness about biology, psychology, neuroscience, and anatomy, has informed my art practice in a concrete way for many years. In this sense, my latest series, Vital Memories is a continuum of not only Dendrites but also my much earlier investigations into the essence of identity from anatomical and spiritual perspectives in pieces such as Witnesses, Self- Portrait, and Insomnia. I continue to be interested in modern psychology, myths of humanity, biology and neuroscience. The underpinnings of the “fight or flight” response, Jungian archetypes and the collective unconscious, folk stories and creation myths, the physiological components of fear and anxiety, the biochemistry of neurons and neurotransmitters, the origin of memory, and the complex relationships we have with one another—these are the topics which fuel my creative process. Can you say something about your show Fundamental Filaments, which will include the series Vital Memories? JM: Fundamental Filaments sheds light in sculptural form on the complex neural and psychological circuitry involved in bringing to life our memories and experiences. The exhibition which opens in October at the University of Rochester’s Hartnett Galley designed by I.M. Pei, will be comprised of 15 sculptures from four separate bodies of work: Dendrites, Vital Memories, Ancestors and Standing. The show weaves together my brain-inspired and figurative work. The sculptures illuminate areas of the psyche that are revealed during unguarded moments, or hidden in the recesses of our minds. 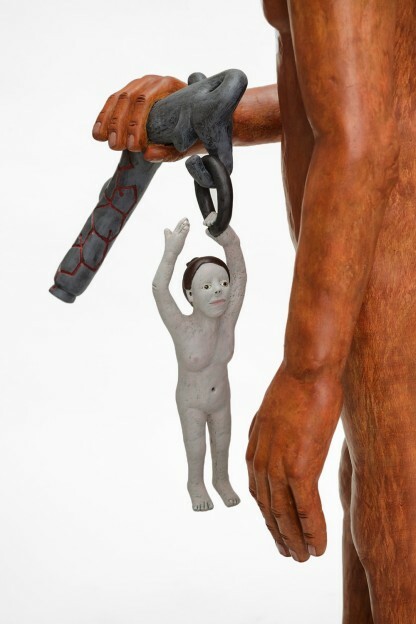 The painted plaster cast figures, derived from human, biological, and organic forms, unmask larger themes of aging, family dynamics and neurological conditions. Decoding our internal physiological and emotive worlds has been an ongoing source of artistic inspiration and interest to me. Examining our similarities and differences led to a desire to understand the brain and the mechanisms responsible for triggering and regulating thought, action, and emotion. As part of the show, I will be unveiling a new series, entitled Vital Memories. This new body of work will be a continuation of Dendrites with a single focus on the memory function. Sculptures will re-imagine aspects of short term, long term, working, autobiographical, collective and compromised memory. For a number of years, memories have intrigued and captivated me. Why are some memories so poignant or joyful or unnerving – and others ephemeral? Which regions of our brains do memories inhabit? They are elusive and breathtakingly incredible. My memories often seem like amorphous mental islands floating in my conscious and unconscious mind. The first piece in the series is called Fading Memory and is based on Alzheimer’s disease. It is beautiful and distressing. I was thinking both about how extraordinary the memory function is, and then of course, about the unfortunate demise of memories through disease, aging and ultimately death. Your Dendrites Series use neurons and dendrites as a springboard to investigate how our brains react to experiences and other neurological conditions. How much is science involved in the realization of these sculptures and how much is the interpretation of science? JM: For me, art has always been a tangible expression of one’s experience. In the case of my painted plaster cast figures in the Standing Series, I wanted to translate my feelings of vulnerability, uncertainty and anxiety—in order to provide a lens for other people to explore their own feelings, which can be unsettling, though equally cathartic. 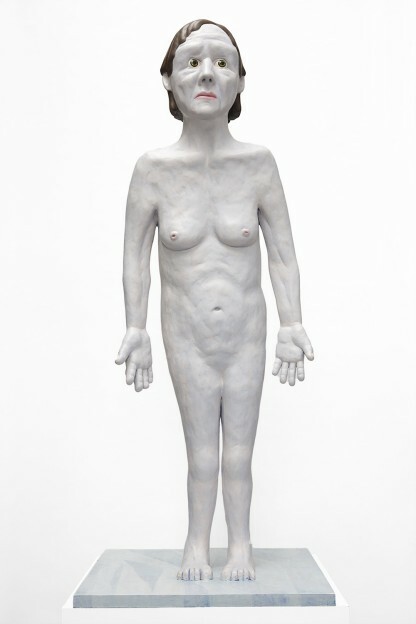 I’m Still Here, one of the six figures in Standing, is a resigned contemplation of her younger, former, more confident self, possibly even the self portrayed in I’m Here!. She is contemplating the life that she did not have, though longed for. 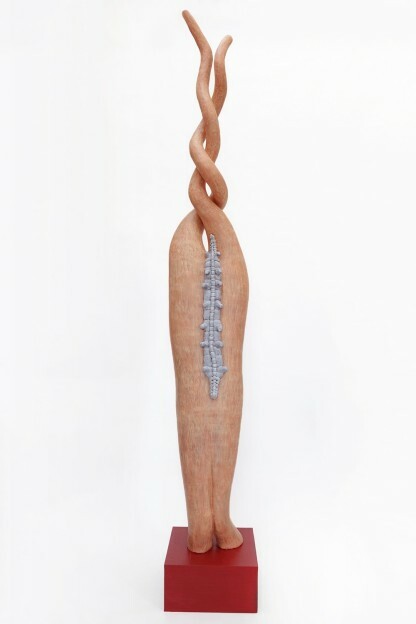 Aging is a recurring motif in my body of work and examined from an interior perspective in sculptures such as When I’m Old and When I Was Young, both part of the Dendrites Series. While rooted in scientific discoveries, the Dendrites Series departs into an imaginative realm involving my interpretation of what these complex cells may look like when one is scared, old, feeling secure or insecure, or afflicted with other mental or neurological conditions. For example, When I’m Scared, is my conceptualization of a frightened neuron. The neuron’s body is curled in a fetal position with its many dendritic arms protectively encasing it. The cell body has a number of cavities filled with red blood cells to amplify its fearful state. Here and There is based on Bipolar disorder, a condition my twin step-siblings have. Scientific research suggests that certain conditions like Bipolar disorder and Schizophrenia have associated degeneration of synapses and dendritic spines. The spines are considered “immature” and do not develop fully. Here and There manifests this discovery in the form of a shortened spine along her back, while the other attributes of her sculptural form are entirely imagined. Her long dendritic arms are intertwined, though never touch. Her rose to deep red nucleus is filled with sunbursts and striations, representing the intensity of both aspects of this condition—the mania and depression with the gradations in between. My work is indebted to science and the observation of the physical and natural world, though differs from scientific inquiry in that it provides a three-dimensional, personal, emotional interpretation of phenomena and experience. From the beginning, humans have sought ways to record their experience in tangible form and leave testimony that their lives mattered. From Stonehenge to Altamira to Instagram, humans have memorialized the time in which they find themselves. In this context, I view the artist as a visual anthropologist of sorts. In my case, I’m rendering a very small sliver in the overarching timeline of human evolution. At this particular period of time, I’m struck among other things, by the amazing advances in neuroscience. Collectively, we understand what’s happening in our brains in a way that we never did before. It’s really quite astounding. While I expect my current fascination with neurons and dendrites to continue for the span of my lifetime, I suspect it will grow before too long to encompass studies involving equally tantalizing areas such as glia, hormones, neurotransmitters, basal ganglia and endocrine systems. How does your figurative and neurological work converge? JM: My neurological and figurative work is converging in a number of ways with many intersections between Dendrites, Standing and my two new series: Secret Chambers and Vital Memories, which will all be part of the Fundamental Filaments exhibition. 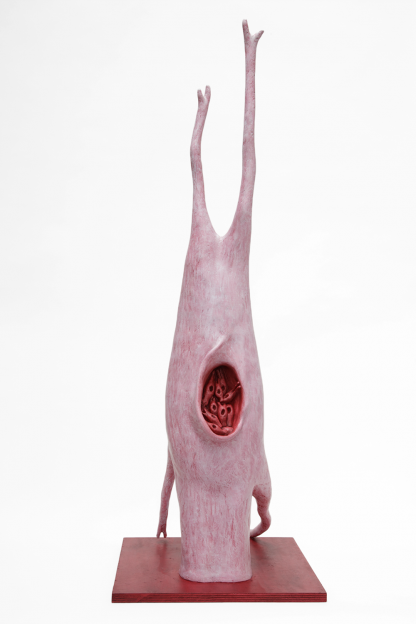 Many of the sculptures overlap in unforeseen and compelling ways. Secret Chambers: Ancestors and Family of Memories both revolve around family dynamics and could be interpretations of the same event addressed from an internal and external perspective. The Secret Chambers series investigates recurring emotive and scientific themes in a way which fuses the internal world of neurons and biochemistry with the external manifestation of particular psychological states. 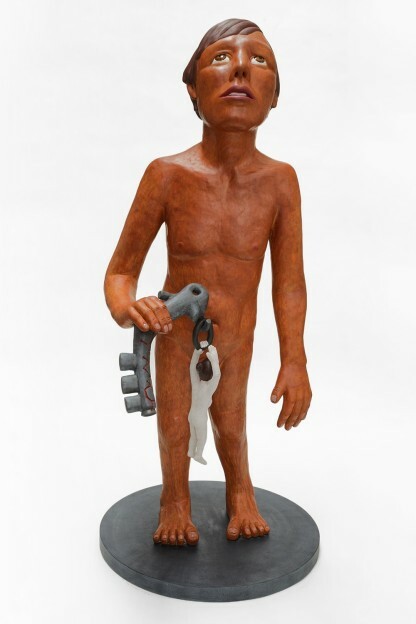 The first sculptures in this new series, Ancestors, involve a concealed family secret involving suicide. 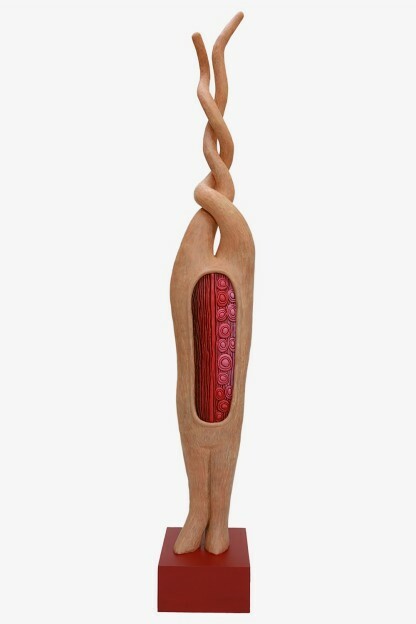 The sculptural group is composed of two figures and a key representing the stress hormone cortisol. The troubled male figure is giving the key to a much smaller female figurine who is no match for the weight of this tragic secret. The key in this particular case is one to unlocking a neural and familial mystery, and is encoded with the steroid hormone cortisol, released in excessive amounts in response to stress. While originating from a personal story, the sculptures are meant to serve as archetypes, not portraits of specific individuals. The larger concept concerns the legacy of a particular concealed action on future generations and the nature of genotyping and psychological inheritance. 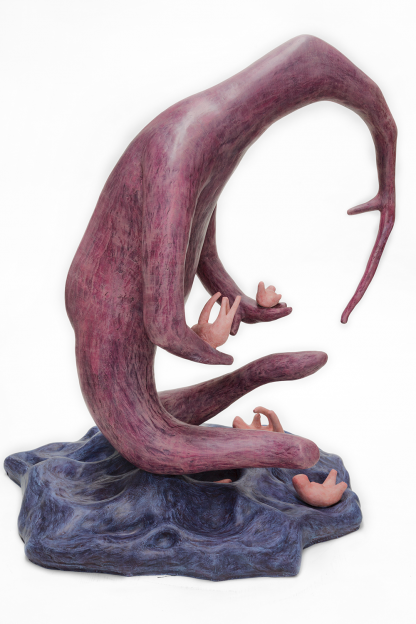 Family of Memories, the sixth and last piece in the Dendrites Series, is composed of three figures in a posture reminiscent of a classical Madonna and child with a noticeable twist. The larger mother neuron is cradling two smaller children in her arms with several newly hatched neurons beside her. She is protecting and shielding them from what lies ahead. 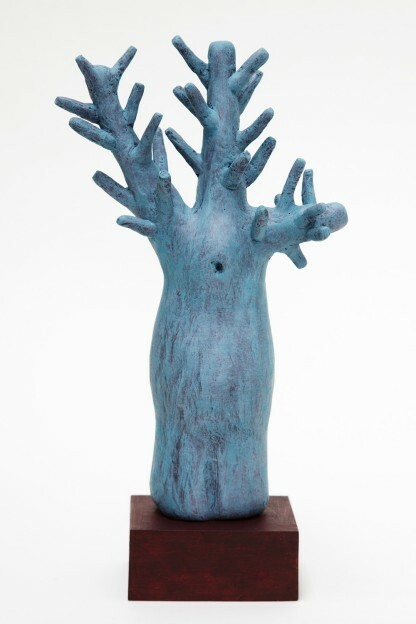 Several sculptures in the Dendrites Series involve the relationship between memory and the aging process. How important is the emotional nature of the work in bringing about an understanding of it? 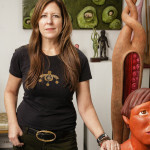 JM: In my body of work, establishing an emotional connection with the viewer serves as a gateway into the piece – whether the sculpture is figurative, or organic, or abstract in character. For some time, aging has been a reappearing theme in my work. I have always been keenly aware of the passage of time, I venture, more so than most, even as a child. When I was younger, as most kids and adolescents, I desired the acceleration of time. Now I would be content to slow things down a bit, though we do not currently have that option! I regularly lose myself in thought about the fragile and remarkable nature of human existence, with the hourglass losing sand not too far in the distance. Several sculptures in the Dendrites series explore the aging process. When I’m Old probes into the manner in which memories and experiences accrue over a lifetime. The figure’s long dendritic branches reach skyward and back in time. The sculpture’s nucleus is filled with smaller replicas of the larger dendrite to emphasize the repetitive nature of emotion and experience as we age. In contrast, When I Was Young reflects the expansive and buoyant nature of youth. 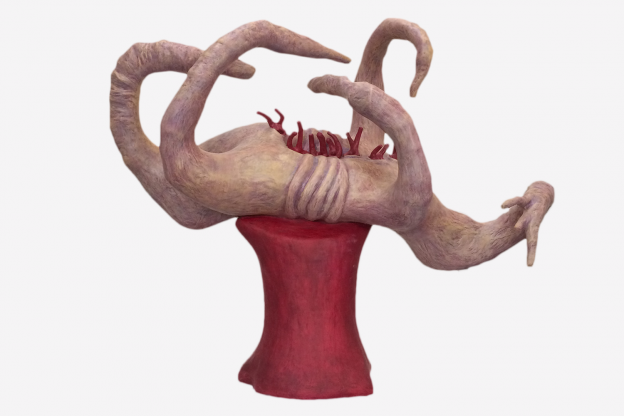 As he is only beginning to store memories, the sculpture has short, chubby spinal branches with a very small nucleus. Relatedly, I recently read an article about developmental abnormalities in dendritic spines correlated to intellectual disability in cognitive functioning and adaptive behavior in infants. Brain function depends on highly complex synaptic connections that are formed during infancy and early childhood. In the case of intellectually impaired children, the dendritic spines were long and thin, and numbered much fewer than in a healthy normal infant. Clearly, this type of scientific fact serves as an imaginative catalyst to me and will inform a sculpture or two down the road. In looking forward, how would you respond, artistically or personally, to a drug, or treatment, which enabled us to pick and choose what memories we cement, or forget? JM: A treatment devised for the curation of memories would be both promising and problematic. On the one hand, eliminating repetitive, disturbing or frightening memories would appear to be beneficial. Yet, rearranging our memory network and function is treading into unknown territory. A perceived benefit of providing more solace by removing unsettling memories could inadvertently dramatically alter an individual’s personality and sense of self. We could create a legion of individuals with emotional amnesia and an inability to process painful events. Many other associated questions materialize when contemplating such a drug. What if memories are clustered together emotionally, which we believe is physiologically the case, and thus by plucking one especially troubling remembrance, an entire category of related memories are obliterated? Leaving a dramatic hole in one’s sense of self and larger, historical memory bank? Disquieting memories may contain fearful elements, though are more than likely involved in other integral stories essential to one’s development as an individual and core identity. The same holds true for trivial and inane memories. While appealing to think of a massive purge of all my “to do lists”, they too no doubt inform my daily activities and functioning. The paradox of our current memory function is that we cannot currently choose which ones to harvest and which ones to delete. I would be in favor of a self-prioritizing memory selection feature, whereby I had the ability to organize memories by type, importance and accessibility. In essence, an internal filtering, search and categorization mechanism allowing for the retrieval and classification of specified events and experiences. Without question, I would relegate certain, especially unnerving memories and even insignificant ones to a less active and conscious level. I would not want to eradicate those memories completely – they, along with the joyful recollections are the building blocks of who I am. What exhibits do you have coming up? 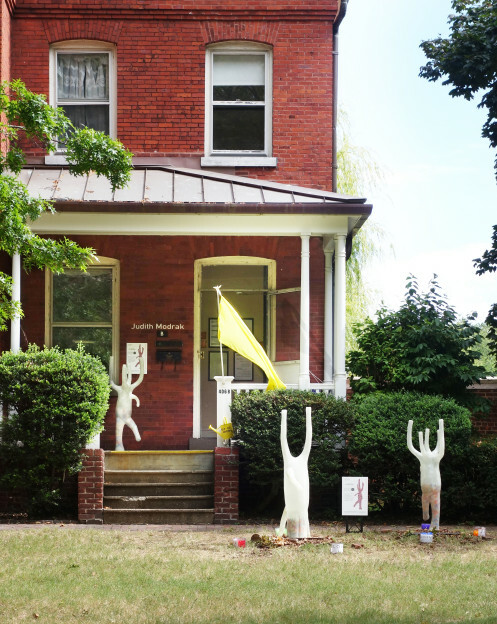 JM: I am very excited about Our Memories, an outdoor installation, which will be premiering at the 9th Annual Governors Island Art Fair in New York City during the month of September. This installation piece is a first for me on a number of levels—my first outdoor sculptural realization, the first time I am using fiberglass resin as a material and, most critically, the first time I am actively involving the audience in the creation of the ultimate work. While this is a natural evolution of my earlier investigations into the origin of memory and emotion, the idea of “creating” a shared memory is a radical departure from my more traditional mode of audience interaction. 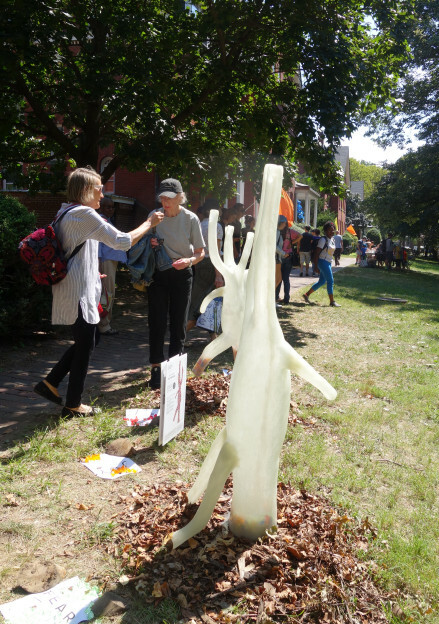 With Our Memories, participants will experience — through sculpture — an awareness of how memories are recorded, stored and formulated. Our Memories will be composed of several translucent, fiberglass cast resin sculptures which will involve the audience in unexpected ways. 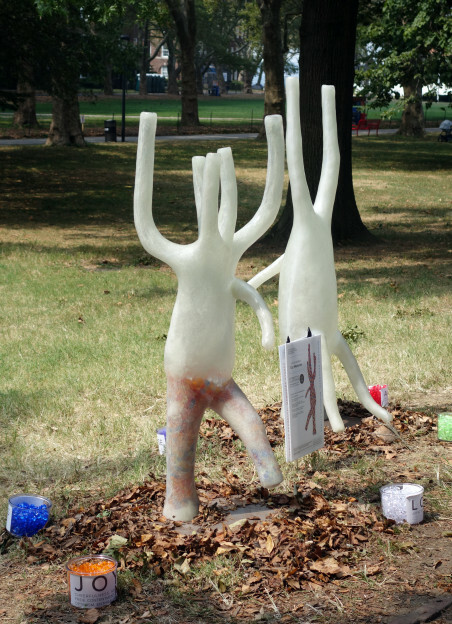 Recognizing the need of humans to record their personal experiences, these neuron inspired sculptures will contain hollow cavities in which the participants can place a color-coded “memory rock” or bibelot. 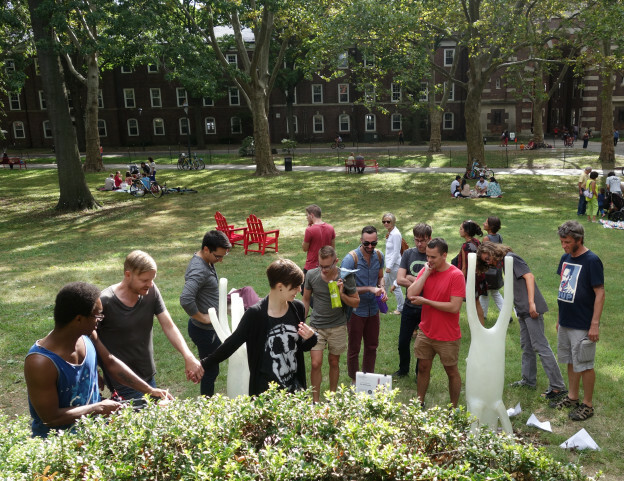 The idea is for the viewer to recall a powerful memory and then share the memory by depositing it in a sculpture. Memories will be color coded into primary and secondary categories of emotion, including joy, serenity, anger, fear, passion and sorrow. The sculptures will take on the colors of the collective “memories” and transform as the piece ages and stores more “memories”. There are many unknowns in the audience engagement component of Our Memories, alternatively causing me great anticipation and a touch of trepidation. Though unlikely, what if no one deposits a color-coded memory? Then the sculptures will remain ghostly, ethereal, translucent empty vessels. More interestingly, what if the emotions associated with the memories recalled tend to be “joyful” and “passionate”? Then the sculptures will be illuminated with an orange light. What if conjuring up a memory tends to bring up sad or wistful sentiments? Then the sculptures will turn a royal blue color and with many striations, almost resembling veins and arteries. Light is another unpredictable factor. How does light affect the sculptures? Will they come to life as the day begins and then be awash in color as the sun beams through them, only to rest at the end of the day in an opaque stillness? These and many more questions pique my curiosity and will be answered in September! JM: Fascinating question and as I pondered it more, I realized that I was not certain if I was recollecting a real “first memory” or an imagined “first memory” from stories and photographs. As I sifted through my memory database, I was struck by how few memories I had or was able to retrieve before the age of 3 and in fact, my memory function seems a bit spotty until around the age of 5 when I can fully recall entire episodes from my life. However, there are two distinct memories which appear around the age of 3. The first one involves swimming and sunshine, not surprisingly, two things I still love many years later. At the time my family was living in Washington, D.C., my birthplace. On a balmy July day, my family visited the Francis Swimming Pool, a neighborhood public pool. The pool was nestled in a magical, wooded park. I do not remember all the nuances of this particular summer day, though I can vividly recall the way the water felt on my skin and the warmth of the sun and that I had mastered more or less swimming or at least treading water. I was ecstatic and splashing about and had to be pried out of the water, pickled and happy after hours. My family was friendly with other families who had children roughly the same ages as my brother and I, so we would make a whole day of swimming and playing games before dusk fell. These were blissful, summertime memories with no inkling of the complexities to come when my parents separated a year later. The second very graphic memory I have is a repeating one that began when I was 3 and continued until I was about 5. It was a nightly experience in which I would see fairy-like humanoid creatures climbing in an out of my bedroom window as I was drifting off to sleep. At the time, I shared a room with my brother and we had bunk beds. Since I was younger, I had the bottom bunk bed situated at eye level with the room’s only window. My imagination was well developed by then and I had convinced myself that a colony of little people lived in the television set and in the transistor radio. My homunculi, no doubt inspired by Gulliver’s Travels and other stories my mother would read to us before bedtime, would appear just as I closed my eyes and would startle me out of my dreamlike state. As soon as my eyes adjusted sufficiently to the dimly lit room, they would recede and disappear only to reappear the next evening. As an adult, it seems insightful and a bit puzzling that this tribe of little people did not scare me. In fact, they were strangely comforting and guided me into a deep sleep on most nights for a two-year period. Perhaps they are still here now in the form of my sculptures!